For the past two weeks, I have refused to go out for Italian food. 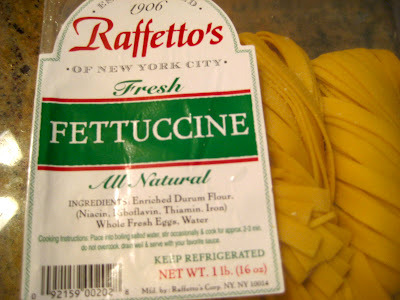 I know that it won't be as good as it was abroad, and I don't want to ruin Italian-American food for myself for forever. But despite my aversion to Italian restaurants in the States, I still crave a hearty bowl of perfectly al dente pasta. So, rather than scour the local Italian joints in search of my favorite dish, cacio e pepe, I figured I would give it a try. Armed with 2 lbs of fresh fettuccine from Fairway, $20 worth of grated Parmesan and Pecorino cheeses, this recipe and my mother as sous chef, I attempted to compile a few of my favorite dishes from abroad into one meal. 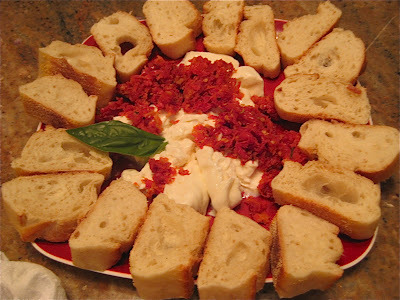 One of my favorite appetizers that my parents and I enjoyed when they came to visit was burrata cheese with sun-dried tomatoes and fresh baguette. I found fresh burrata from Fairway (my favorite supermarket, I'm really sorry if you don't have one, you're totally missing out), threw some sun-dried tomatoes in the food processor, and voila. The plate was devoured within seconds. Cacio e pepe easily translates to cacio cheese and pepper. It's a simple, traditionally Roman recipe that requires little prep or cooking time. 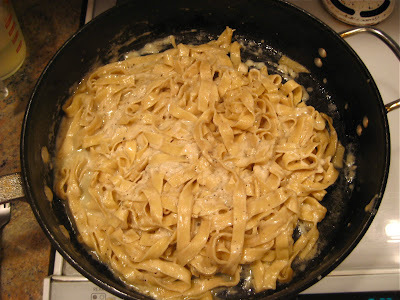 The fresh pasta cooks in a minute, then is thrown into a pan with cracked black pepper, some butter and some pasta water. It's tossed until evenly warmed, then hit with handfuls of Parmesan and Pecorino cheeses. Toss some more, add more pasta water if it's too thick, and serve. It's such a simple yet satisfying dish. For sides, we had a fresh tomato and basil salad tossed in a garlic infused olive oil (simmer olive oil with two cloves of garlic until the cloves are browned, removed cloves and pour oil over the tomatoes), and asparagus baked with shaved asiago and butter toasted breadcrumbs. Not heart-healthy or waist-friendly, but so easy and SO delicious. My father's still raving about it, two full weeks later.